Software piracy is a pressing problem for software vendors as these activities can directly affect the bottom line. Organizations that use software are often affected as well. Along with rising software prices, they can face stiff fines and other costs for noncompliance with software licenses. These issues can come as a result of audits that software vendors are more inclined to initiate in a slower economy. 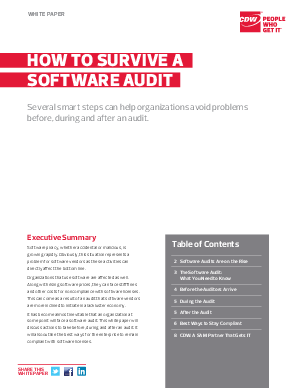 This white paper will discuss actions to take before, during and after an audit. It also will outline the best ways for the IT management of enterprises to ensure compliance with software licenses.